Pololu Zumo with Bigger Buttons! The Pololu Zumo 32u4 is an excellent educational robotics platform, but its buttons proved difficult to manipulate for some of the students in my classes. I designed these bigger buttons as an add-on for the Zumo. My hope is that students will find these buttons easier to access. .stl files for printing out your own button adapters are available at the project GitHub repository. 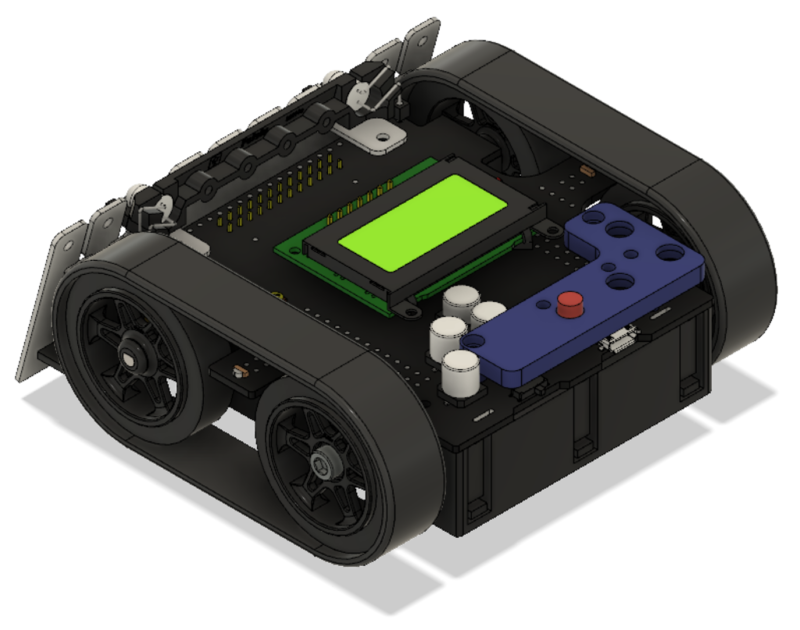 In addition to the five printed parts, you will also need some #2-56 hardware to attach the add-on to the robot. If you have ideas for how to improve these designs, please download the Fusion 360 files available in the project repository. If you make something you like, let us know so we can improve our design. Bigger Buttons at Mount Holyoke. Bigger Buttons on inch scale. Please let me know if you find this useful! I would especially appreciate pictures of the printed parts in action. This entry was posted in Projects, Robotics, Uncategorized. Bookmark the permalink. One Response to Bigger Buttons for the Pololu Zumo!